No one likes mornings. Well, actually, that's a lie. Some people like mornings, but I'm definitely not one of them. I hate being tired and my eyes always get super puffy and dark circles appear too. If you're like this too, then today's post is for you. 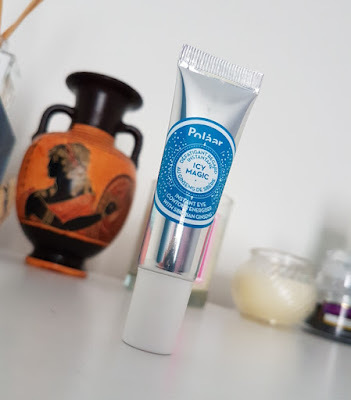 My recent Birchbox provided me with the opportunity to try out the Polaar Icy Magic Instant Eye Contour Energiser eye roll on which promises to help you look instantly rested and refreshed. In addition, it also helps to stimulate eyelash growth, claiming to provide at least 30% added natural volume of the eyelashes after 15 days of daily use. The cooling roller ball applicator is designed to help to drain the eye contour area and reduce puffiness, the look of tired eyes and dark circles. I was really excited as the previous two Polaar products I've tried out have been fab (see my review of the Polaar Polar Night Cream). As a side note, if you landed on this page from looking up reviews of the September Birchbox samples, I do have a couple of in depth reviews on the Dr.PAWPAW balms that were also featured in this box. The Icy Magic eye roll on that I have comes in a metallic silver squeeze tube with a rollerball applicator and it holds 10ml of product. I looked it up on the Polaar website and the packaging for the sellable product appears to be different, but it states that it also holds 10ml of product. To make matters more confusing, when you view the product on the Birchbox website, the packaging is different again (but still holds 10ml). Therefore, I'm not 100% sure on which is the correct packaging, but the consensus between all of the designs seems to be that you will receive 10ml. If anyone can confirm or correct me on this, please do let me know!